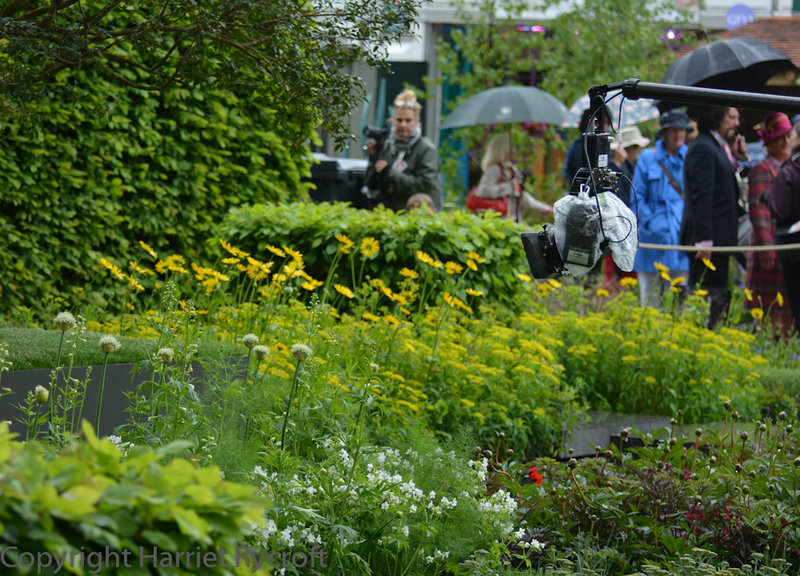 Chelsea Flower Show – No balls of steel this year, but plenty of nerve. 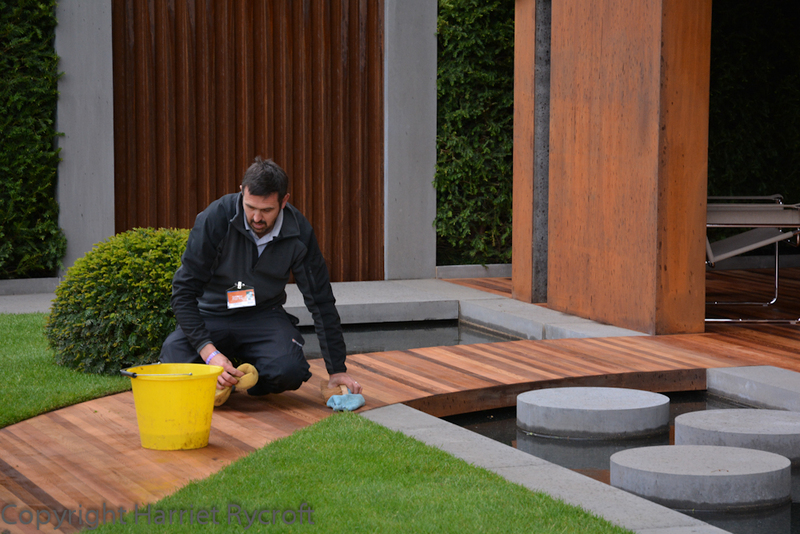 You’ve got to be tough to do a garden at RHS Chelsea Flower Show. I’m not talking about the long designing and sourcing process, the nightmarish logistics and labyrinthine rules, or even about the physical slog of build-up in all the many weathers that May can throw at you. I mean you need mental toughness. Once you have built the thing and polished it to the nth degree, you must bite your nails and stay out of the way while the judges inspect it and try not to listen to rumours about why so-and-so “was robbed” last year, or even what the judges are said to be looking for this year. You must have the courage of your convictions. Looking pristine. Adam Frost’s Homebase Urban Retreat, in association with Macmillan Cancer Support. Gold Medal. 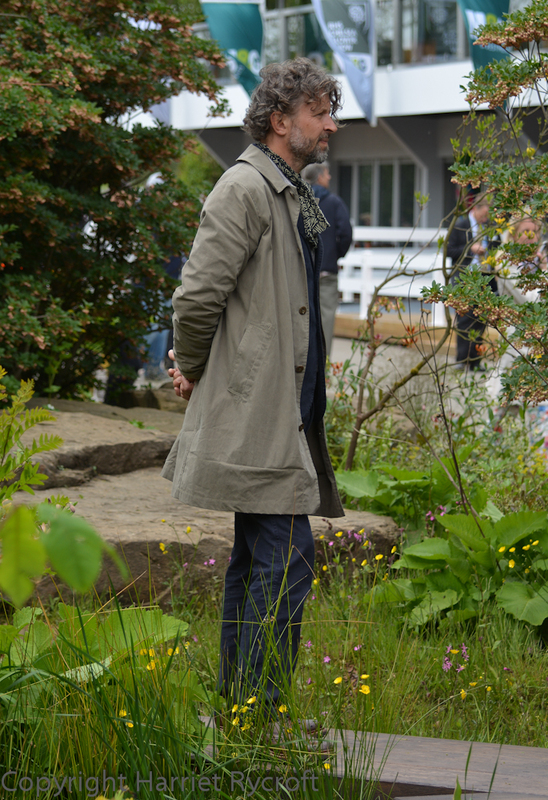 Matthew Wilson’s Royal Bank of Canada Garden. Silver-gilt. Matthew Wilson was brave, as a well known panellist on BBC Radio Four’s Gardener’s Question Time he’s a very experienced garden designer but this is his first Chelsea garden, so he has plenty to lose; his progress has been followed closely during the build-up to the show by GQT, and there’s nowhere to hide on Main Avenue. At first I was underwhelmed by his garden but the more I looked at it the more I warmed to it. 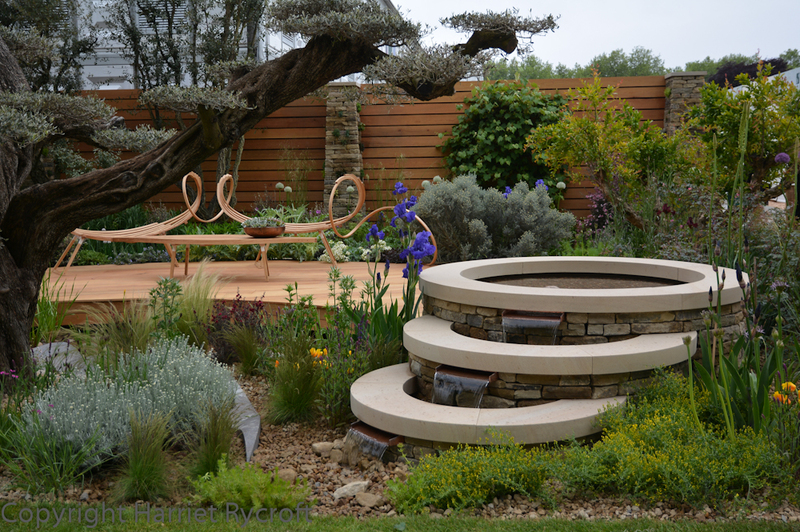 I’m not going into details of design here because others will cover it better than I, it did clever things with harvested rainwater and thoughtful planting which are actually relevant to “normal” home gardeners. It does pay to look closely and repeatedly at all of the gardens, big and small. Sadly, when there are downpours, umbrellas, crowds, proper photographers and BBC cordons to contend with this isn’t always possible in the flesh. 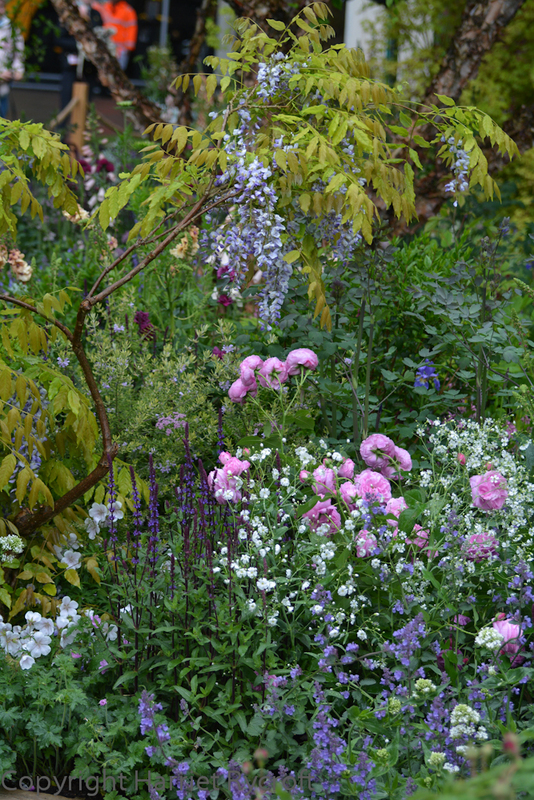 Ideally I would go on Monday for the fun, watch the BBC coverage all week and go again on Friday or Saturday to see whether my opinions (or indeed the planting) had developed. 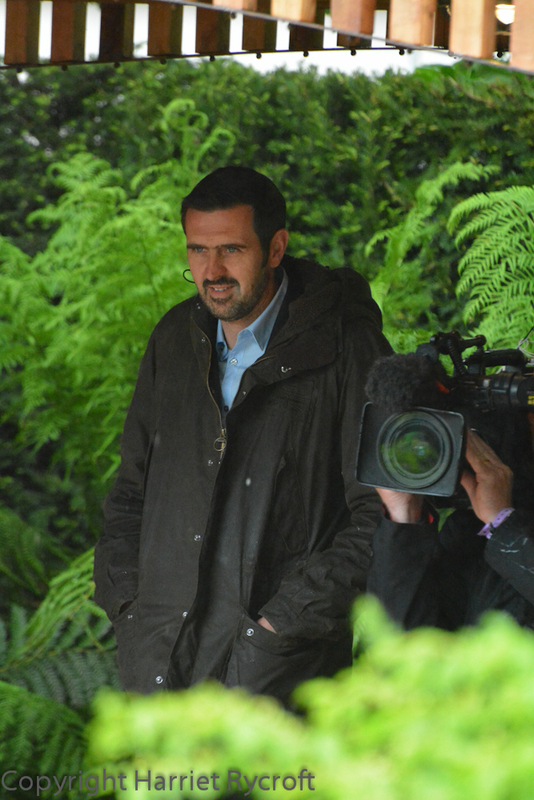 The BBC’s boom camera getting the views ticketholders can’t of Marcus Barnett’s Telegraph Garden. Gold. Those paeonies should be open by the end of the week, I’ll have to let the BBC and other bloggers show me what they look like. Everyone wants gold, of course they do and I hate to see people looking deflated when they don’t quite make it. If it were me I’d be handing out gold medals to almost every exhibitor, but of course that would be pointless. A gold medal is not just a feather in your cap: for designers it means a happy sponsor and hopefully many future sponsors and clients. If you don’t get gold you can’t wallow in whys and what ifs and self pity; you have to make the most of it, learn and carry on. Now that takes strength. Given all this, designers could be forgiven for being extremely precious about their creations. 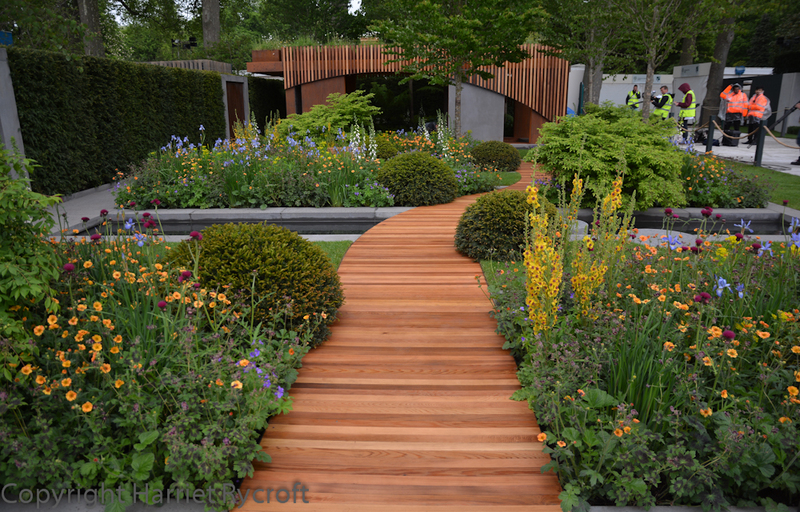 I’d say that everyone knows that the gardens are out of bounds before the judges come round, but after they’ve made their last visit on Monday things may start to get out of control. There are publicity shenanigans to cope with, not just the parading of the odd celebrity in a brightly coloured outfit. 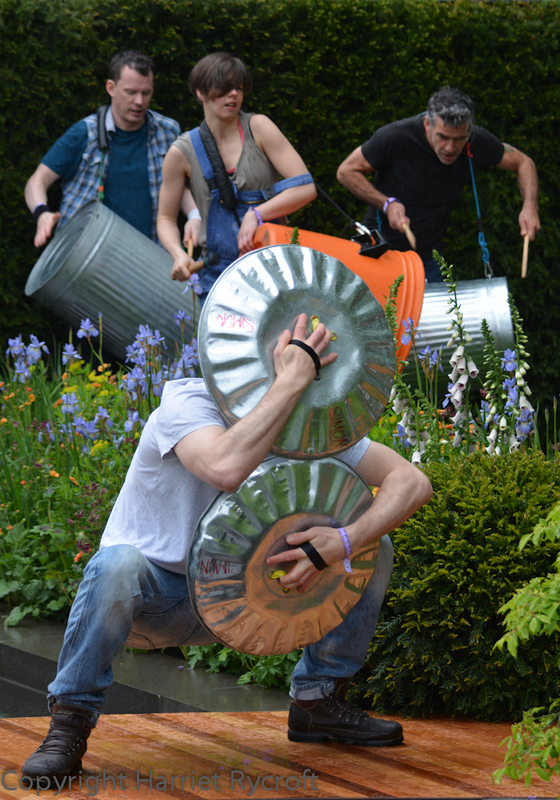 This year none was noisier than the invasion of Adam Frost’s garden by some of the performers from Stomp. There’s a clue in the name. It was loud and wild and one of the drummers nearly fell in a flowerbed. It looked and sounded wonderful and I had great fun taking photographs of it between the heads of the gathering crowd. I like to see a show garden animated but I did feel for Adam, who watched in the shadows, trying not to let his anxiety show. I was filled with admiration for him because he came out with good humour after they had finished and posed for photos with them, horsing around a bit for the cameras. My respect grew when I met him later and he admitted that he had been terrified, especially as the performance was a lot wilder than he had expected. 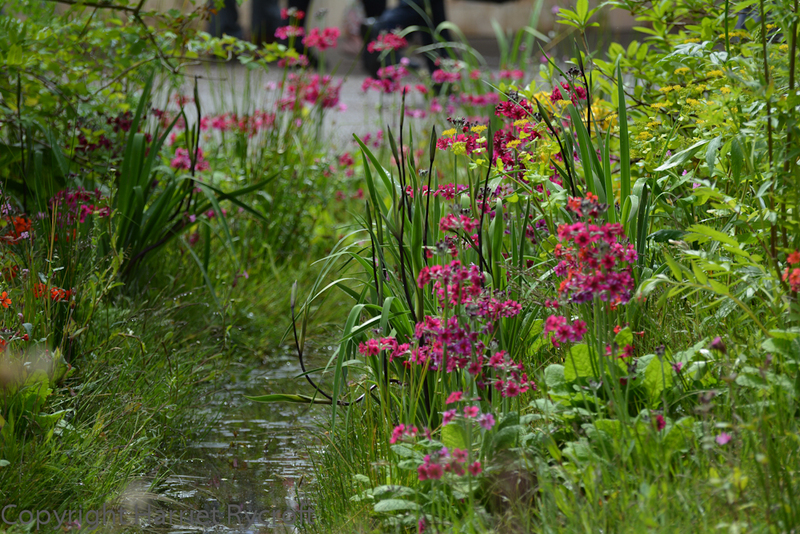 Jo Thompson made a really beautiful garden, complete with swimming pond and covetable oak building. She makes show gardens I would be delighted to have as my actual garden – there aren’t many designers I can say that about. In my opinion it deserved a gold, but I haven’t seen the brief or the judging criteria. Of course the natural swimming pool needed demonstrating. Cue the three courageous ladies of Aquabatix, complete with floral swimming caps, looking like extremely hardy aquatic alliums. Cue also an enormous scrum of photographers thundering up the hoggin paths of the garden at one end and trampling grass at the other. “Girls! Girls! This Way!” I admired the way the synchronised smiles never left the swimmers’ faces as they glided into the chilly water. I was told that when it was all over and they went off with towels barely covering their goose pimples that the pack still followed them. Tough ladies. Talking of goose pimples reminds me of Dan Pearson. Much of his work makes the hairs on the back of my neck stand up. He is a man who really LOOKS. He looks at natural landscapes and plant communities and gets under their skin so well that he can reproduce their quality for a garden or a park. I remember being bowled over by the last Chelsea garden he did, in 2004, which involved ridge-and-furrow and naturalised Tulipa acuminata. I really couldn’t understand why it only got a silver-gilt and I remember vividly the exhausted distress on his face when he got the news. No wonder he had a break from Chelsea after that. But he has come back with a bang. Building on the notoriously awkward “Triangle” at the end of Main Avenue, he has concocted essence of Chatsworth. Never mind the huge, apparently teetering rocks, just look at the plant matrix! 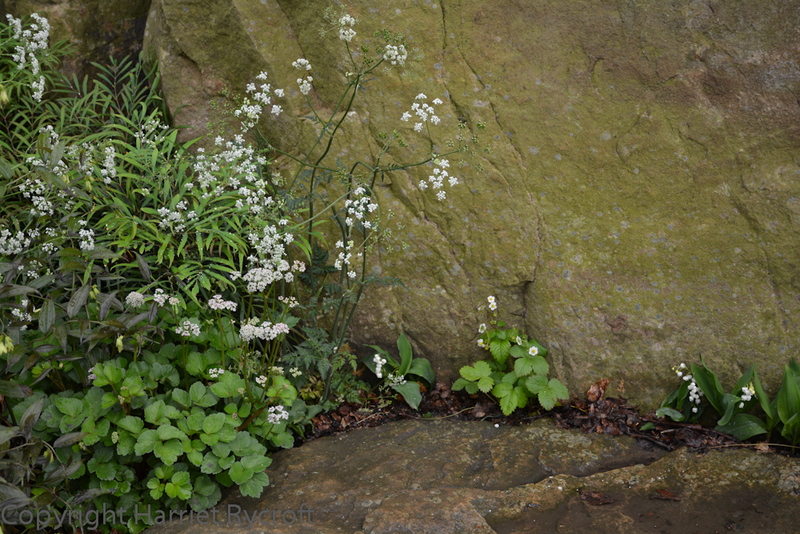 No crevice left unplanted in Dan Pearson’s garden. From every angle of every side of the triangle there are delightful vignettes. 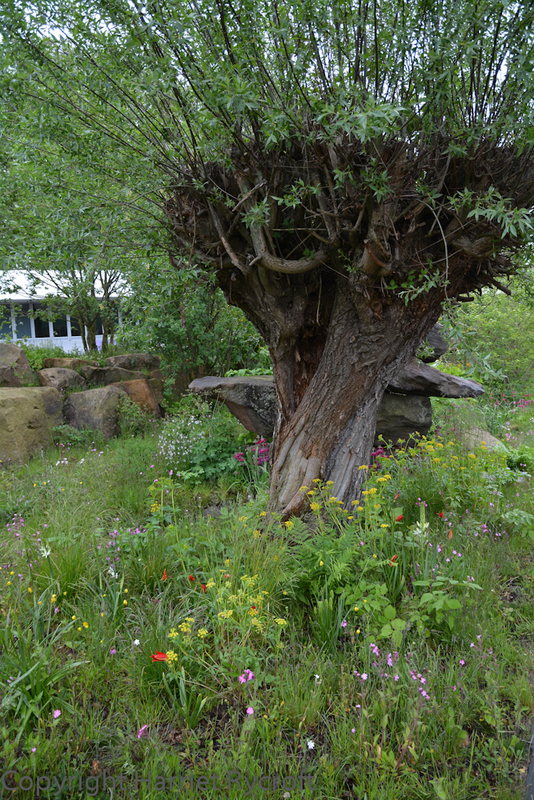 Plants, bulbs and wildflower turf knitted around rocks and streams and an ancient pollarded willow. It’s masterful and I am so glad it has brought him gold and Best Show Garden. Sadly most of the day was dark and rainy, but a few rays of sunshine in the afternoon made me wish I could take all my photos again. This I could not have done, even if I had been allowed to stay past 3pm, as my wide angle lens died in the damp. Never mind, I’ll soldier on! Thanks Heather, I think I took about 450 photographs, so I have plenty to think about – but I still missed so much!